A fierce looking, bearded red-head staring directly into the eye of the observer - the icon obviously looked like the one of Pitman! And the game is 3D, too! Ha! But a dwarf and a dungeon doesn't need to lead to the same game. Dylan Nagel, the game designer of Dwarf Quest's developer Wild Card kindly gave me a promocode to try their game. And I did! Totally fascinated about what could have been made with the same components, but different attitudes in game design. Both games are obviously about a single bad-tempered dwarf hacking his way through a dungeon (crawler). 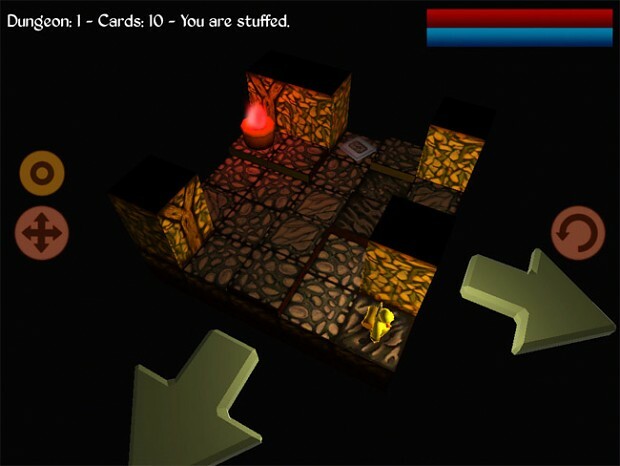 Dwarf Quest and Pitman both use Unity 3D as game engine, and both were hugely inspired by the board game HeroQuest for the look&feel of the gameplay. The story our dwarves take part in are placed in typical uninspired dwarf settings, containing dungeons, catacombs and ancient abandoned places. And in spite of a far too typical plot about a heroic mission you have the urge to go deeper and deeper into the dungeons. Starting from the same fantastic board game - HeroQuest from 1989 - it is quite interesting how some design decisions differ between each game and how they went into totally different directions. Upon starting the game, both game screens look the same: A character standing in a room, ready to face his destiny. In all possible ways to walk next a (huge) arrow awaits your click to move on. In Pitman the next "room" falls down onto the space where the selected arrow was. These rooms ("cards" in the game) are randomly chosen out of several predefined rooms, all in the same size of X*X tiles. So you build the dungeon while playing the game. The dwarf in Pitman is - in fact - wandering between more or less extruded boxes that are presented in different themes. Turning these in rooms, halls and other dungeon parts is something we leave to the imagination of the player. 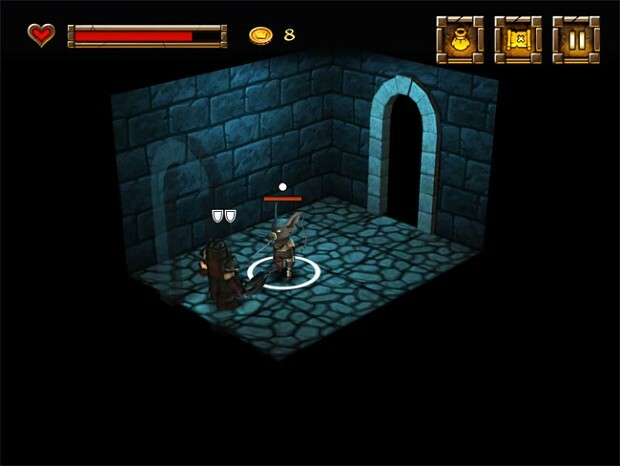 In Dwarf Quest all levels you pass are designed by the author and presented like a diorama to the player. 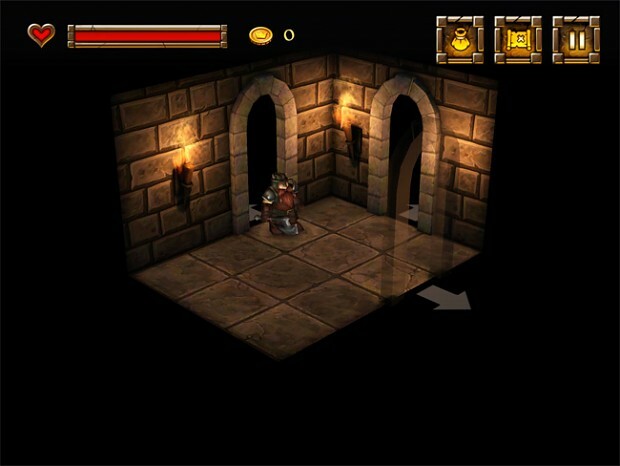 The dungeon is linear, but you can often choose more than one room to enter the next. Plus all the rooms have different styles like hall, passage, corner or a single chamber. -> Learning: We liked the minimalism of those automatically generated tiles that should give you a certain freedom AND strategy where to go next. Moreover, this decision was necessary for rogue-likes to always have the player experience something new - after the many occurring deaths. Although I liked the easiness with which this level system was built, I have to admit that I envy the beauty of the more detailed and predefined level tiles Dwarf Quest did absolutely well. Our intention back then (over a year ago) was to let the player see their level creation in a whole - every time. But it would have been a lot more atmospheric to have separate rooms. 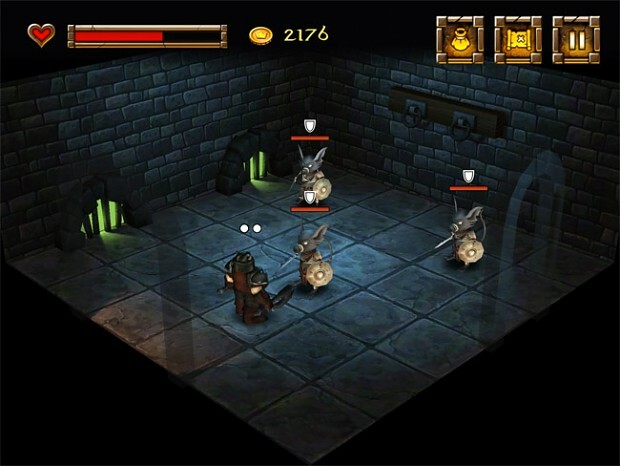 Pitman and Dwarf Quest are both turn-based, although in Dwarf Quest the movement outside of battles is not restricted by turns, respectively called real-time. In Pitman your movement per turn is restricted by the speed skill of your dwarf, which is two tiles at the beginning of the game and can be leveled up with growing experience. In both games you tap/click the enemies to death. 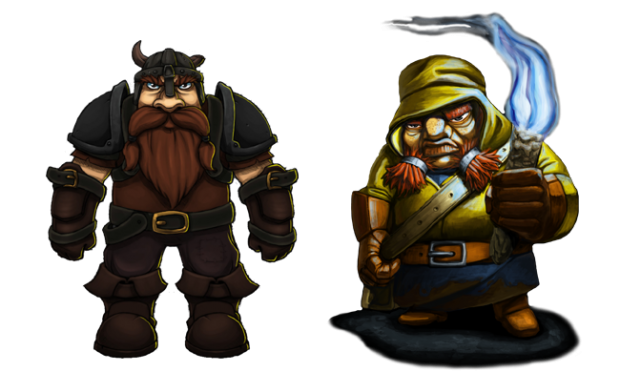 While in Pitman enemy and player each have one move - which is attack and/or movement in turns, the dwarf in Dwarf Quest has three actions. You can move, slash and defend yourself - all in one turn. How many actions your opponent has depends on the type of creature and can be used tactically. Archers for example are weak and never walk around, but have two nasty energy-sucking shoots. Therefore it is wise to keep two of your action points for defense, which is built up automatically by clicking longer on your dwarf; the last action point then can be used for movement. -> In both games the position of the player relative to their enemy is important. While in Pitman this decision is often narrowed down to finding a place where just one enemy at once can attack you, choosing a right position in Dwarf Quest can be important to save action points for attack and defense. Especially the success in a battle against more than three enemies depends on where exactly you place yourself to kill your opponent. Weapons are always an interesting matter when it comes to role-playing games, dungeon crawlers, rogue-likes and hack'n'slay games. 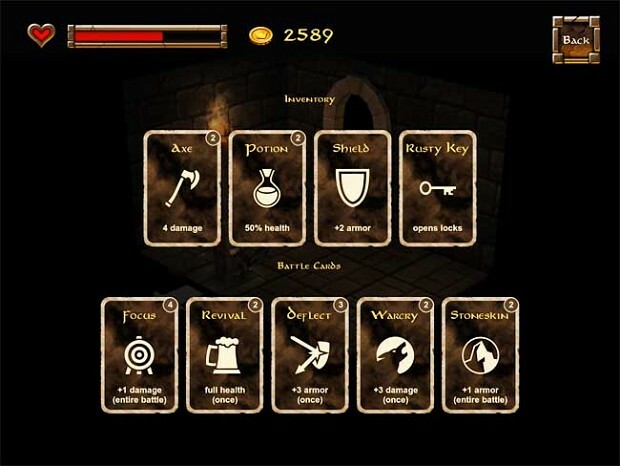 To give the player some kind of choice and also a lot to loot, such games often present a vast variety of weapons, often together with different fighting styles. Both don't necessarily add much to the gameplay itself, but they give players the opportunity to fight with magic, close combat or ranged combat, just how they favor it. In Pitman you have ranged and close combat. Both can be used as magic (Deadly Touch and Magic Missile) or weapons (Blade, Blunt and Bow). All these elements can be used by the player, but are only effective when leveled up. Additionally you can increase your attack value by improving the skills Dodge, Block and Dexterity. 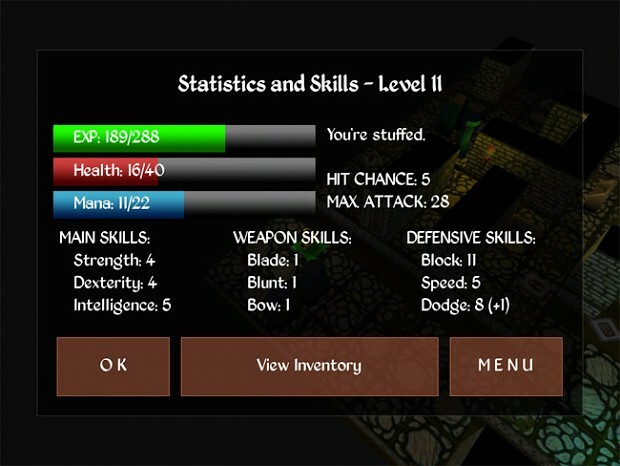 Compared to Pitman the designer of Dwarf Quest decided to not struggle with different systems and simplified the weapon usage to one axe and (later in the game) a second axe that strengthens your attack. The game uses a card system instead, that strengthens you attack or armour in battles. But the added points vanish after the battle. -> Looting is the best thing about role-playing games! And swag is THE reward after a hard fight and needed to have the player stay on the ball. That's why we have all these different kind of weapons in Pitman (and it could have been much more, still). But one problem also comes with a lot of weapons, at least if they play different: balancing. You should ask yourself if different weapons, tons of stats, a variety of fighting styles and level-up possibilities are worth the hard balancing work. Or if they are really necessary for the enjoyment of the player. Or if their couldn't be find another system, like the temporary card system, Dwarf Quest uses. Therefore, Pitman can be extremely confusing. Finding a 40+/-8 (strength/dexterity) might sound great, but if you are wearing a shield and armour you might never strike your enemy, which is due to a bad balance AND terrible stats communication. In contrast to our game, the decision to not level up and add just one new weapon and new armour later in the game might often better for the developer and the player! -> The game itself should be the challenge, not the thousand possible adjustments you can do after a level-up - or more stupid: Doing a huge character stats adjustment BEFORE the game even starts. I still don't understand why some games bother their players with these kinds of decisions before they even know what the game is about. In Dwarf Quest I had this feeling of being cheated or that the gameplay is badly balanced just one time - when encountering the Rat King. This is the only enemy in the game that is recharging. You have to use one of the battle cards that add extra damage to kill it at once. Which I hadn't in my inventory, what means I needed to restart the whole game. -> Well, achieving nothing by clicking on an enemy is no fun at all. And not being able to progress because one item is missing, either. You should fix dead ends like this - just like everything that is no fun and frustrating the player. Next to the looting, RPGs are all about evolving, getting better, stronger and unbeatable. Pitman is totally different. We added hunger and corrosive weapons. Whatever strength, intelligence, dexterity or weapon power you achieve - those two elements make the game always quite uncertain and more dangerous in the higher levels. What we realized too late: These elements make an interesting survival game out of our rogue-like. But bad communication from us and the lack of the players' desire to just try every possible item to get further made these elements not very nice for many Pitman players. Dwarf Quest in comparison to that is totally solid. There is no evolving, no new weapons you can choose later or things getting broken. Stronger enemies in the later levels are not just the ones from the first level, but harder (unlike in Pitman, where enemy types get reused constantly). There is no surprise in the gameplay that attacks you randomly. -> Hunger is a critical game element, moreover when people don't realize they have been killed because of not eating enough. I still liked experimenting with those unstable and random elements, because when you try to secure yourself with the right stuff in your inventory, those are the elements that can truly spice up your game! But the "moving" elements should have been more visible and emphasized to the player, and next time we add them to a game again we will consider this. Just the comparison of the elements of these TWO games shows what little design decisions can make the big difference. The games are, in fact, not at all the same, although they look very much like the same old wine in new hoses. I realized while playing Dwarf Quest what we could have made better with Pitman and that it is important to know exactly what you want to achieve with your game. It is sometimes better to emphasize on one or two elements, instead of putting them all in. Dwarf Quest shows what a clean, well designed and polished game could look like. But I also miss the random elements in it, although that is exactly what failed Pitman somehow - more or less, depending on your will to survive. So, you can decide which way of the dwarf you will enjoy more. The random, biting adventure or the clean killing. My advice? Give them both a try and troll the dungeons! A very nice comparison where I think the author tried to stay objective as much as possible (given the condition that he is actually the developer of one of the games that should have been super-hard). I now have both games, but in the beginning I was totally mixing them up as well. Thus it is interesting to see someone "from the inside" to actually take the time and tell everyone the difference. :) I am afraid, though, that similarities between the games might hinder one of them to get e.g. on Steam or Desura (the way it happened with Explodemon).